Keep pushing it Gary I have been pushing the same think all my life in theory ! Never ever give up on it. I agree Gary. There needs to be a serious review of whether a phD or formal academic qualification are truly a necessary prerequisite for certain jobs. Lived experience is often worth at least as much (and often far more) than second hand study. The onus should be on proving skills, not how you came by them. Agreed! But there’s so much to do. 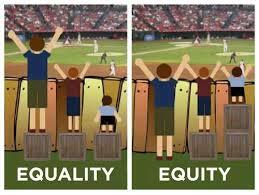 The National Disability Strategy 2010-2020 (NDS) is about “providing equality and the opportunity for each person to fulfil their potential” … it’s goal is equality (of opportunity), not equity. Governments might argue that blind people have an equal opportunity to see since they encounter just as many photons as the rest of us … or they would if they turned the lights on. And most people in wheelchairs have equal opportunities to walk. Sadly, most disability peak bodies endorse the NDS. Yes, telling people things is not enough. Often they just don’t hear. Change is challenging: first they need to receive the message, they have to understand the message, they need to agree with the message and then they must decide to act effectively. Then they may need to get others to act in support. Congratulations on your successes at the personal level.